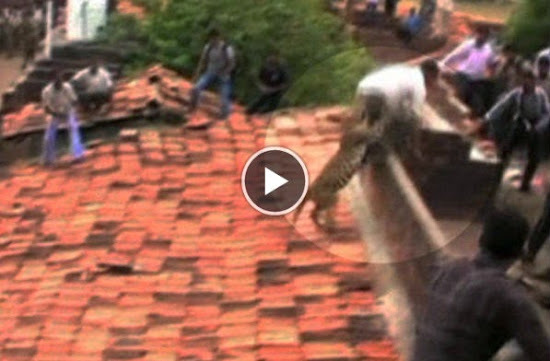 Panic looms among the residents of Ballarpur village in India's western Maharashtra, after a leopard hides on the rooftop of a house and on being found, runs amok. The drama in Ballarpur, Maharashtra, was caught on camera as villagers tried to get away from the big cat - it was later released back into the wild by authroties. A leopard on the loose in India hid in the roof of a house and bit a man on the backside as it chased terrified locals who were attacking it with sticks. The drama in Ballarpur, Maharashtra, was caught on camera. As villagers tried to get away from the big cat , one man was too slow and got a sharp set of teeth in his rear. Luckily he escaped from the big cat's jaws and fell over a wall, while the animal ran in the other direction. Activities such as logging, deforestation and growing villages mean incidents like these are becoming more and more common in India, reports Sky News. The reduction in the cats ' natural habitat forces them to wander elsewhere in search of food. As frightened residents tried to capture the equally terrified animal it attacked another person - but nobody was seriously injured before the leopard found refuge in a bathroom. India's Forestry Department later caught the animal and will be releasing it into the wild.